How might we create meaningful connections between elderly as they sculpt who they are for the next stage while removing the sense of urban isolation and loneliness? The Horseshoe is a community of older individuals who meet to share stories, learn from our past, and create new experiences that add value to the local community. The Horseshoe helps to reveal their skills that strengthen who they are and what they are capable of. People moved closer and closer to be nearer their workplaces. AN urban square footage became increasingly valuable and units grew smaller and were stacked higher and higher.Despite being physically closer than ever before, people started feeling increasingly isolated in their cubicles. An estranging alienation was seething under the surface of the city – the sense of loneliness can be most acute in a crowd. What products, services, or spaces that battle this urban loneliness and create meaningful interactions between people? 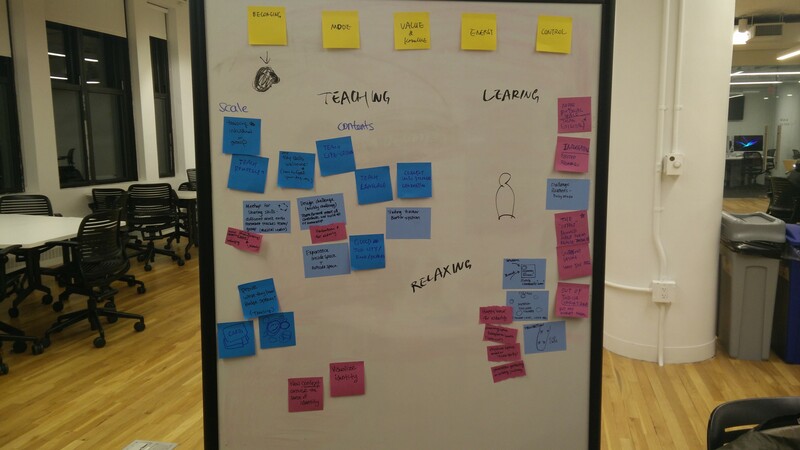 To begin with, my team brainstormed and used a ‘5 Why’ method to identify the reasons of the loneliness of elderly. Then, we extracted five core characteristics. One of the important keywords from the research and brainstorming was ‘identity’. The elderly experiences the change of their identity, and it may bring them disappointment and frustration. We investigated the values of the elderly that shape themselves. we also created multiple personas to identify concrete needs of the target group. We specified that mid-level retired professionals might feel the huge loneliness from retirement, physical condition, and decrease of social activities. How might we incorporate the five core characteristics into redefining one’s identity? We defined that the elderly needs social acknowledgement and connection based on their values. To design a platform, we sketched a system map and revised multiple times. Each user experience delivers the different characteristics that we identified in the framework. 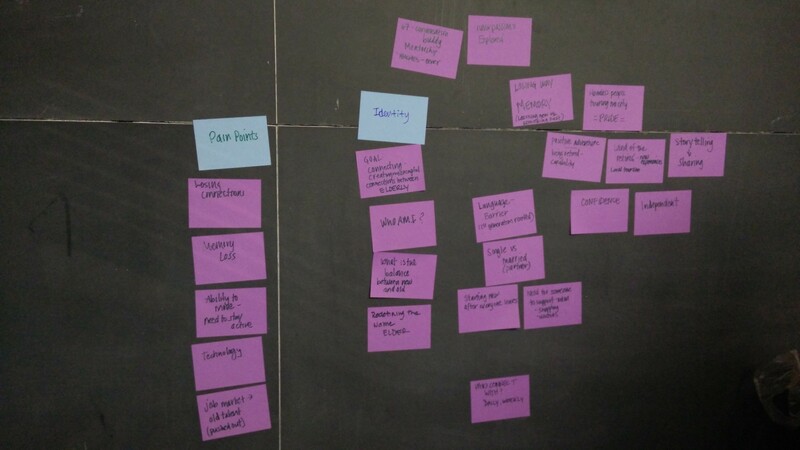 After designing the first system map, we met Ted, a retired professional and community organizer in Brooklyn to verify our ideas. His feedback built our ideas stronger. Based on the system map, we designed more specific touch points and channel. Below is the service blueprint of the platform. We are a community of older individuals who meet to share stories, learn from our past and together create new experiences that add value to the local community. We help to reveal our skills that strengthen who we are and what we are capable of. We encourage the community to share their challenges with us and in teams, we will contribute to society. Learning and growing into the next stage: Together. The name of Horseshoe is from a horseshoe which helps to move a horse and has a meaning of good luck. Moreover, a horseshoe crab is the oldest living animal species. Below is the values of our service by each user journey. Belongings: Invitation to join a group of individuals who inspire the user to become re-energized. Mode: Physical, location based touch points that communicate value across different modes of technology. Energy: Transportation reduces a stress of physical strain. Inspired by Google Bus in San Francisco: engaging user mentally. Control: Transportation provides access to the Horseshoe location. Belonging: Ability to share past experiences with others through suggested prompts. Value: Bring knowledge, skills, passions, interests to the forefront. Energy: Mentally challenging self to share what they have been holding onto. Belonging: Group expresses empathy as the listeners and storyteller unite over prompts shared by the storyteller. Value: Group extracts personal experiences, knowledge, and values that the storyteller possesses. Belonging: Based on feedback, interests, and skills, elderly are invited to work on a team together. Starts a new relationship with members of a local community. Control: Ability to select the team they best connect with based on skills, interests, etc. Mode: Opportunity to challenge one another to learn new technology. Value: Elderly contributes their perspectives and skills from past knowledge and experience. Control: Together, the team selects the projects that align with interests. Each member takes responsibility for the success of projects. 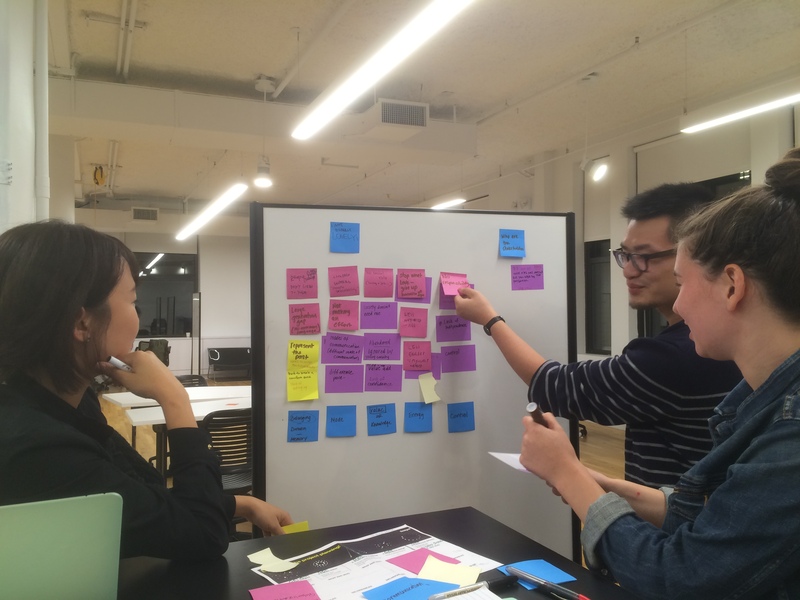 Belonging: By sharing ideas with others, teams build empathy. Value: Opportunity to present solution to others and share how the concept will live in the society. Energy: Ability to learn from what other groups did. Opportunity to present the solution they developed. Belonging: Team strengthens the relationship with one another by starting a new project together. New members are invited to join the team. Control: Elderly can select the same team or select a new team based on experience.